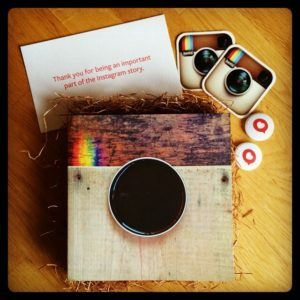 Thank you Instagram for the gifts! 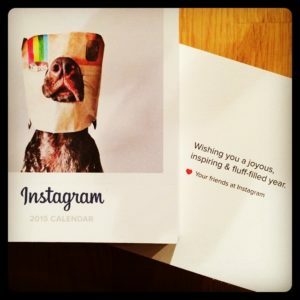 Back in July Instagram sent me a beautiful little thank you gift for being, in their words, “an important part of the Instagram story”. It was a coffee table book with photos and stories of a selection of Instagram users. Included was also a card and a couple of stickers and pins. A very nice gesture I think. They called it #communityfirst. Apparently it was sent to Instagram users who had once been featured as “recommended users”, i.e. part of a list of users that Instagram recommend newly registered users to follow. I was featured on that list between October 2011 and August 2012. This resulted in a massive amount of followers, peaking at 100510 to be exact. This as since dwindled to 75950 as of today. The overwhelming majority of those does not seem to be very active though. But it is a nice big number to look at. Today the second gift this year from Instagram arrived by FedEx, all the way from Canada! This time it was a calendar for 2015 featuring a full year of animals from Instagram. It is printed on unusually thick paper for this type of calendar so it is quite a hefty block of photos. I’m not usually a fan of animal photos, but I will give this very nice gift a chance. Thank you Instagram!